Richard McCreadie has his work cut out for him as the Executive Chef of The Jockey Club at The Fairfax at Embassy Row in Washington, DC, yet this talented Scottish chef is well suited to the fabled restaurant that is sure to win your heart. 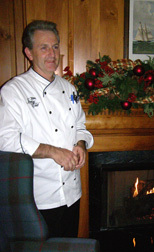 I met with Executive Chef Richard McCreadie in The Fairfax Lounge before having dinner one chilly evening in December 2008. Sitting by one of the roaring fireplaces, I learned that there is much more to this talented chef than meets the eye. Although he grew up in Scotland, he has honed his culinary craft working in the United Kingdom in country house hotels, which are small luxury boutique hotels, as well working throughout the world including the Grand Cayman. His culinary style is heavily French with modern influences, using not so much flour, but rather reductions to add flavors, as well as using herbal oils, which he creates. As the Executive Chef of The Jockey Club, which reopened in late 2008, his time for the moment is dedicated to creating new recipes for the restaurant, doing his research, and sourcing local products. When not working in the restaurant, his other passions, besides spending time with his wife, a native of Washington, DC, is playing squash and racing motorcycles. Chef McCreadie graciously provides a delectable culinary taste of The Jockey Club with his recipes for Corn and Crab Chowder; Peanut Crusted Scallops with Baby Greens; and Rack of Lamb that will satisfy your taste buds until you can dine at the restaurant. Method: Cut corn from the cobs. Cook with the cream, white wine, curry, and bacon bits for at least 1 hour over low heat. Blend well and strain through a sieve. Add the Madeira wine and season to taste. When ready to serve, bring the chowder to a bowl, turn off the heat and add 2 ounces of the butter and whip to combine well. Sauté the potatoes and the crabmeat with the rest of the butter (1/2 ounce) and add to the chowder just before serving. Garnish with the chopped chives. Important Note: Do not boil chowder after butter has been added, as the chowder will separate. Method for Lemon Salad Dressing: Mix the lemon juice, warm honey, and Dijon mustard together with a whisk and then slowly add the olive oil, and season to taste. Method for Peanut Scallops: Pre-heat oven to 325° F (163° C). Place peanuts on a roasting try, sprinkle with all of the spices and roast in the oven for 15-20 minutes. Let cool. Grind the peanuts and spices together until they look like fine breadcrumbs. Slice the scallops horizontally and coat with the peanut mixture. Heat a non-stick sauté pan with a small amount of olive oil until the oil starts smoking. Add the scallops one at a time and cook for 1 minute on each side. Serve with the baby greens tossed with the lemon dressing. Method: Pre-heat oven to 400° F (204° C). Heat your pan, add clarified butter, let smoke slightly and then add the lamb fat side down, sear until brown, take out of the pan, let cool slightly, and sprinkle with sea salt and rosemary butter. Place in the oven for 5 minutes, and then reduce the heat to 350° F (177° C). Depending on your oven, cook until desired temperature is reached. Sauté white polenta cake in butter; spread goat cheese on top of cooked polenta cake, and top with a slice of foie gras terrine. Reduce lamb stock with the wine until it reaches a syrupy consistency, and then season to taste. Garnish with the vegetables and deep fried or oven dried salsify chips. 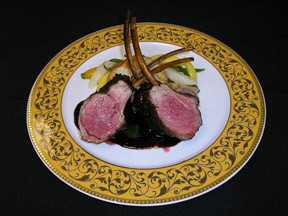 Arrange lamb on a platter as desired. The Jockey Club is open for lunch and dinner. Read other articles on The Fairfax at Embassy Row in the Hotels and Resorts section and on The Jockey Club in the Restaurants section.